It is a great idea to convert your backyard in a private playground for kids. But it is certainly incomplete without wonderful play sets. It's okay if you have not purchased any play equipment before. Factoring on the below factors would help you out in making the right purchasing decision. You should begin with measuring the area where you will install the play set. By this, you would get an idea of what type of equipment would fit the best in the available space. While searching for these on internet, you would come across many play sets like swing sets, play slides, play houses and more that are loved by kids. Select the one that can be easily installed, leaving enough space for children to perform other activities. Play sets are available in metal, wood, plastic and aluminium. Make sure the one you are picking is durable in nature and can easily withstand extreme weather conditions. 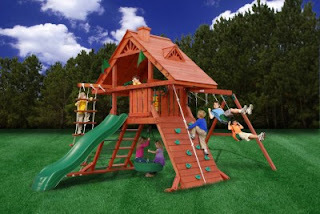 Deal with an IPEMA certified manufacturer and ensure he has constructed the home play set in accordance with the guidelines defined by ASTM and CPSC. Do not forget to check the bar, hinges, railings, chains and other anchors in the play set. It should be installed in the requisite places for the safety of kids. Moreover, you can also opt to buy ADA compliant playground equipment for backyard. This would allow kids with special abilities to enjoy with your children in their private playground.